One of the more common criticisms of the state of Australian rugby is that there’s no depth, or even that there’s not enough quality to cater for four Super rugby teams, let alone one more with the arrival of the Melbourne Rebels in 2011. These criticisms place Australian rugby in the classic catch-22; without the four (and soon to be five) professional teams, places are very limited and the chance for young players to impress is often brief, and almost always cut-throat. Either way, the talent argument or how much of it there is or isn’t, is actually for another day. Looking around the Super 14 this year has seen some pretty handy young players making their mark already, and I’ve picked out four to focus on this week. 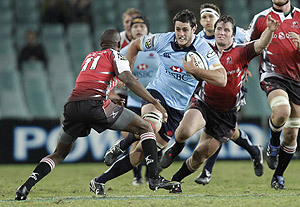 NSW Waratahs flanker and lock Dave Dennis is one player who has already got plenty of wraps from the actual and armchair experts, which should come as no surprise after Robbie Deans took him to Europe at the end of 2009 after a starring season captaining Sydney University’s premiership side. The 24-year-old didn’t take long to establish his place for the Tahs this season, and his strong form on their South African tour was enough to consign long-standing lock Will Caldwell to the bench after the return of Dean Mumm from suspension. Moving back to blindside flanker has been a godsend for Dennis though, and his performance in Friday night’s rout of the Lions particularly, was pretty hard to ignore. In the first half on Friday night, Dennis’s large frame was a constant presence in the tackle and ruck areas, but it was in the second half as the game opened up where Dennis really came into his own. Suddenly he was making line breaks and offloads seemingly at will, and proved to be a headache for the already-aching Lions defence in centre field. If there were repeat phases to be had, Dennis was in them up to his ears, and he was a crucial link between forwards and backs in attack. I don’t want to go making rash statements (for a change), but I can see a lot of Wallaby captain Rocky Elsom in Dave Dennis currently. It wouldn’t surprise me one bit to see him in a Wallaby jumper before the year is done. ACT Brumbies playmaker Christian Lealiifano was tipped by plenty – me included – to be the main loser with the return to Canberra of prodigal son Matt Giteau. After young flyhalf Matt Toomua finished the 2009 season in strong form, and found himself as a late call-up on the Wallabies’ Spring Tour, the thought was that Lealiifano would spend most of 2010 on the bench, and that the Melbourne-raised midfielder would become an inevitable signing for the Rebels. He may well end up returning home in 2011 yet, but if he does it won’t be because he’s unwanted in Canberra. Lealiifano has instead benefitted massively from Giteau’s return, and has slotted into the inside centre position almost seamlessly. What’s more, because Giteau is under pressure to deliver a title and walk on water at the same time, Lealiifano has been able to ply his creative trade at No.12 with little or no pressure at all. More often than not, Lealiifano is calling the plays for his outside men, rather than Giteau, and it would appear that the Brumbies are pinning their attacking game around Lealiifano in that New Zealand-style second five-eighths position. Queensland Reds inside centre Anthony Faingaa was something of a surprise naming in the Reds’ No.12 at the start of this season, but since then, he’s repaid new Queensland coach Ewan McKenzie’s faith in spades. While the likes of Quade Cooper, Will Genia, and even rookie speedster Luke Morahan are getting the rave reviews in the Reds’ cracking season start, Faingaa has been a constant performer among these names, even if he hasn’t been as widely noticed. His defence has always been a strong point, and this has certainly continued to be the case in 2010, though admittedly, anyone defending in the line next to Quade Cooper is going to look fairly solid. But he’s also a straight, hard running centre, not unlike NSW’s Tom Carter, and Faingaa’s ability to hit holes really shone in the Reds’ 50-10 demolition of the Western Force in Brisbane on Sunday, where he scored his first and then second try for the Reds since moving north from Canberra at the end of 2008. While his talent was always evident, it seems he’s finally benefitting for the same thing every young player craves: opportunity. On current form, there should be plenty more of it coming his way. Western Force flanker Ben McCalman first caught my eye a few weeks back, when I forced myself to ignore a lifetime’s worth of backline instinct and watch forwards for a weekend (yes, it was painful, and no, I’m not quite back to normal). Having made his Super rugby debut from the bench in round 1, McCalman was elevated to the starting line-up following the long-term injuries to Wallaby backrowers Richard Brown and The Roar’s own David Pocock, and has just gone from strength to strength since, albeit in some fairly well-beaten Force teams this year. While there’s been seemingly weekly shuffling of the troops in the Force pack of late, McCalman has been a fixture in the No.6 jumper, and his work in combination with openside flanker Matt Hodgson has been a rare highlight so far in a season the Force desperately needs to get back on track. Like his Sydney Uni team-mate Dave Dennis, who then went to Europe last Spring, McCalman was brought into the Wallabies pre-tour training squad having grabbed the attention of Robbie Deans while playing strongly in last year’s Shute Shield finals. His ability to cover lock and backrow can only be a good thing for his future selection hopes, and it’s not difficult to picture him in Australian colours in the coming years.